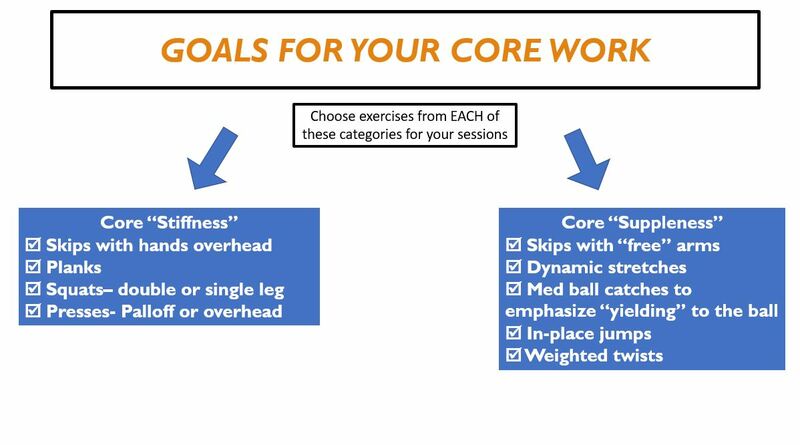 We all know that “doing core” is important ancillary work for endurance training efforts. However, traditional “ab circuits” (high reps, short rests) actually do very little to prevent injury or provide the stabilizing benefits we are really seeking with “core” work. Furthermore, fitting auxiliary strength work around a busy schedule can prove challenging and may often fall by the wayside. These are some efficient exercises and protocols for runners who want to see specific adaptations to the demands of the sport. Why is Core Important for Running? In running, the pelvis, shoulders, and torso—the larger “core,” or “pillar”—act as the anchors for your swinging arms and legs. Without core stability or “stiffness”, your limbs would flail about uncontrollably. However with running, you don’t want the anchor to be completely stiff. Ideally the muscles throughout the “pillar” will behave like slings, which stretch and snap back with the movement of each limb. As the muscles of the pillar are pulled back by a leg or arm, they absorb force. As they snap through, they apply force. So, you want the muscles throughout your “pillar” to be stiff enough to keep your stride efficient, but supple enough to withstand the constant pull-and- snap motion as your limbs swing through each step. When you run, the body must absorb at least 3.5 times your bodyweight, with each step, so strength work for the pillar region should include loads greater than your bodyweight. It should also Include complex activities that challenge your core to stabilize and coordinate with swinging limbs and up-and-down movements. Do most of your exercises in an upright position, since that is most specific to running. And be sure to include some light reflexive work to enhance the pull-and-snap reflexes of the muscles in the torso region. Focused core activity before the run serves as a warmup and a small core circuit. If you do ten minutes of core/warmup before most runs, this adds up to 40-50 minutes of core each week. That is an excellent culmination of weekly core strength. 4-5 exercises x 10-15 meters. Choose a combination of free arms and arms overhead. Skip forward, backward, and sideways to hit the core in several planes of motion. 4-5 exercises x 5-8 reps each. Again, choose different planes of motion to train the “pull-and-snap” in several different movement patterns. 8-12 plank variations x 20-40 second holds with 10-20 seconds rest in between each variation. While planks are not performed upright, most runners love them, and planks become more effective core stabilization exercises if the bigger muscles are pre-fatigued from the run. 10-12 exercises x 30 seconds or 15 reps with 15-30 seconds rest in between each exercise. To really challenge the muscles in the torso and pelvis to fire properly, train them with heavy loads when they are fresh. When your muscles are firing on all cylinders, rather than fatigued from long endurance bouts, they will coordinate the most efficient firing patterns. In these separate sessions, incorporate some loaded exercises and light reflexive work like in-place jumps. Squats, weighted twists, and presses. Choose 2 variations from each of these. Do 2-3 sets x 6-8 reps using challenging weight. Focus on core position throughout the movements. Choose light hops in several planes of movement. You are training the core and limbs to coordinate the pull-and-snap reflex that occurs when landing and pushing off during running. Perform each hop for 10-20 seconds with 20-40 seconds rest in between. Alternatively, you can sprinkle a few hopping movements into any weighted or bodyweight circuit that you want. 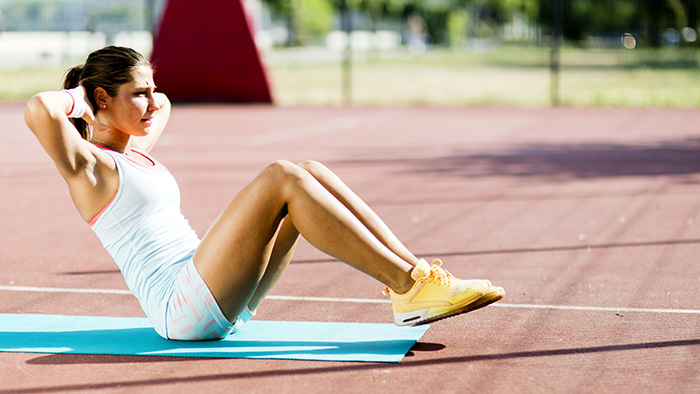 Core work can be a bit of a chore, but your strengthening activities need not be time consuming or boring. Choose exercises that you enjoy and will challenge and enhance your running mechanics. Choose protocols that you can manage to stick to as you navigate your daily workouts. A little every day goes a long way towards keeping you healthy and on the roads.